The Sharp PN-L401C Aquos Whiteboard Series is the next generation in office display. This 40" option comes with face-up, landscape, or portrait orientation. The Sharp PN-L401C Aquos Whiteboard interactive display systems are designed to greatly enhance communications and productivity. Reinforcing the lineup is the 40" Class (39.5" diagonal) PN-L401C interactive display, which also enhances the consumer experience in retail locations by serving as an interactive information interface. 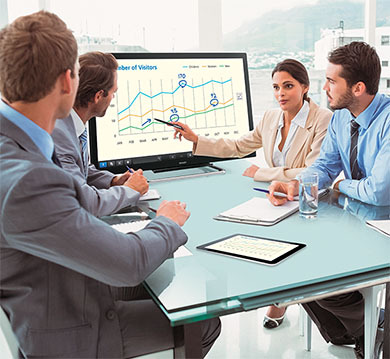 In the business world, the PN-L401C interactive display is ideal for increasingly popular "huddle space" meetings in smaller areas for two to six people. Making the most of huddle spaces can optimize communications and accelerate business to a whole new level. With its 10-point multi-touch functionality and high-sensitivity capacitive touch technology for a precise and smooth pen operation, the PN-L401C interactive display shines in a variety of roles and locations. Whether installed face-up or in a landscape or portrait orientation, it excels as an interactive information interface. Not only is it a powerful meeting tool, it can also be used to engage and inform people in stores, museums, showrooms, and other public spaces. When it comes to digital signage, the PN-L401C interactive display's versatile, feather-light touch capabilities add great value. For example, customers can easily browse through vivid store merchandise images and access information about products with a simple stroke of the finger. Although fingerprint soiling is common in digital signage, the glass screen is protected by a special anti-glare film that not only minimizes fingerprints, it also reduces glare and reflections in brightly-lit areas for optimal visualization.